We told our foreman to make a tape of the techiques they use to make a job successful. They shot most of the footage themselves on various construction projects through out the year. From massive waterfalls projects, with 72,000 GPH of flowing water, to repairing holes, to building lakes, this video shows your foreman how to do it. This video reveals the "steps within the steps" that help make a job go smoothly. The artistic side of creating a natural stream and waterfalls is covered. Big projects, not covered in other videos, are shown here. Creating a profitable project requires a good system and knowing how to handle problems when they arise. Foreman need to know how to keep everything in order. 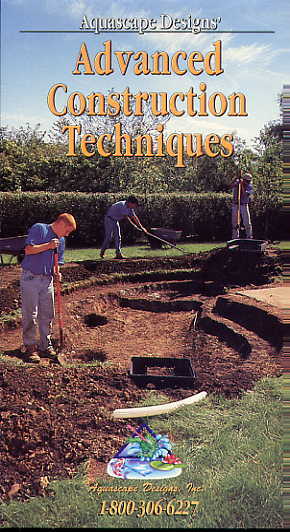 This video is excellent training for anyone interested in getting behind the scenes of successful water feature projects.